Artistic representation of all the five known potential habitable worlds including now Gliese 581g, the best candidate for an Earth-like exoplanet so far. All of these planets are superterrans (aka Super-Earths) with masses estimated between two and ten Earth masses. Numbers below the planet names correspond to their similarity with Earth as measured in a scale from zero to one with the Earth Similarity Index, one being identical to Earth. (Phys.org) -- New data suggest the confirmation of the exoplanet Gliese 581g and the best candidate so far of a potential habitable exoplanet. The nearby star Gliese 581 is well known for having four planets with the outermost planet, Gliese 581d, already suspected habitable. This will be the first time evidence for any two potential habitable exoplanets orbiting the same star. Gliese 581g will be included, together with Gliese 667Cc, Kepler-22b, HD85512, and Gliese 581d, in the Habitable Exoplanets Catalog of the PHL @ UPR Arecibo as the best five objects of interest for Earth-like exoplanets. Doubts about the existence of Gliese 581g appeared only two weeks after its announcement on September 29, 2010 by astronomers of the Lick-Carnegie Exoplanet Survey. Scientists from the HARPS Team from the Geneva Observatory, which discovered all the previously known four planets around Gliese 581, were not able to detect Gliese 581g out of their own data, which included additional observations. Further analysis by others scientists also questioned the existence of Gliese 581g in the last two years. Comparison of the estimated relative size and orbits of the five exoplanets around Gliese 581. The green shade represent the size of the habitable zone, or the orbital region where an Earth-size planet could have surface liquid water. Planets e, b, and c are too hot for liquid water and life but g and d are in the habitable zone. Planet g is specially in the right spot for Earth-like conditions while d is marginally within these limits, and colder. This is the first case of a stellar system with two potential habitable exoplanets orbiting the same star. Now the original discoverers of Gliese 581g, led by Steven S. Vogt of UC Santa Cruz, present a new analysis with an extended dataset from the HARPS instrument that shows more promising evidence for its existence. The new analysis strength their original assumption that all the planets around Gliese 581 are in circular and not elliptical orbits as currently believed. It is under this likely assumption that the Gliese 581g signal appears in the new data. This signal has a False Alarm Probability of < 4% and is consistent with a planet of minimum mass 2.2M [Earth masses], orbiting squarely in the stars Habitable Zone at 0.13 AU, where liquid water on planetary surfaces is a distinct possibility said Vogt. 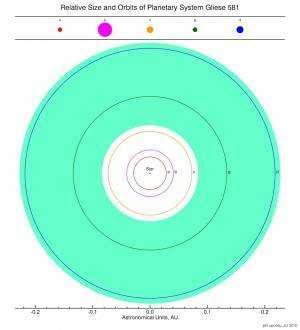 Based on the new data Gliese 581g probably has a radius not larger than 1.5 times Earth radii. It receives about the same light flux as Earth does from the Sun due to its closer orbital position around a dim red dwarf star. These factors combine to make Gliese 581g the most Earth-like planet known with an Earth Similarity Index, a measure of Earth-likeness from zero to one, of 0.92 and higher than the previously top candidate Gliese 667Cc, discovered last year. The controversy around Gliese 581g will continue and we decided to include it to our main catalog based on the new significant evidence presented, and until more is known about the architecture of this interesting stellar system said Abel Méndez, Director of the PHL @ UPR Arecibo. Authors on the original paper are Steven S. Vogt, UCO/Lick Observatory, UCSC; Paul Butler, Department of Terrestrial Magnetism, Carnegie Institution; and Nader Haghighipour of the Institute for Astronomy and NASA Astrobiology Institute. Their research is published online on July 20, 2012 in the journal Astronomical Notes, 333, No. 7, 561-575. It's very exciting to see this era of discovery taking place in our lifetime. The next generation of telescopes, several nearing completions as we speak, combined with advances in data processing, will be a rennaisance of astronomy. The funny part is that most people have no idea it's happening. It's like the time when Europeans first started to explore and colonize the Americas and the common person probably wasn't aware. It's really amazing to see history being made right now, and knowing how significant it will be. I think we are on the brink of an epiphony in terms of how many stars have planets. I personally suspect that it will be rare to find a star without planets, and since our solar system has 3 Earth-like planets (Venus, Earth and Mars), it's reasonable to expect other stars to have them too. If our solar system is "normal", then not only will it be common to find Earth-sized planets, but they will also tend to be found near the habitable zone. Therefore it has no magnetic field. It's atmosphere is probably frozen out on the dark side of the planet. The star is metal poor. 'Habitable' is a very relative term here. There's unlikely to be any planet in the universe (let alone around nearby stars) that is habitable to the point where a human could live on its surface without a suit. It may or may not be tidally locked. Being tidally locked or not, it may or may not have a magnetic field. However, one thing is for sure, and that is that its atmosphere cannot be "frozen out" on the night side. Its not physically possible to have an atmosphere on one side of a planet and none on the other. What planetary mass would make it impossible to leave using a conventional rocket? It may or may not be tidally locked. Being tidally locked or not, it may or may not have a magnetic field. However, one thing is for sure, and that is that its atmosphere cannot be "frozen out" on the night side. Indeed it is if it's tidally locked. It would be frozen "gas" on the night side. It would not be present at all on the day side because it would have accumulated on the other side or boiled off. In fact it's highly likely this is the case, though some recent studies have said that at certain pressures an atmosphere of a certain composition can distribute the heat evenly enough to avoid this. This assumes a lot of specificity about the atmosphere though and isn't likely. I agree with the rest of what you said but can you explain this further? How come we havent found any planets around our local stars? e.g. alpha c & sirius. Surely local observations are easier. As for rockets & planetary masses. I reckon we'd struggle to leave a planet with around 2g but i havent done the math. Density of atmosphere is also a factor. Launching from mars would be a piece of cake. Finding extra-solar planets is not easy, we only detect them indirectly, and distance does not necessarily correlate with degree of difficulty. We mostly find very large planets that have a large gravitational effect on their stars, perhaps the closest stars to us have smaller planets? We can find smaller planets, like the ones mentioned here, by transits, where the planet passes in front of it's star... but to find these their orbital plane must line up perfectly with our vantage point, or they would never pass in front of their star from our perspective. We find planets that are coincidentally aligned with our view just perfectly so that we are able to see them eclipse their star... we cannot just pick a star and determine if planets exist there or not however, not yet. ModernMystic- how about the magnetic field of Mercury? Is that not significant enough for you, yet Mercury rotates about it's own axis only 3 times every 2 orbits around the sun. If you are subscribing to the dynamo theory for magnetic field generation then yes, you might have a problem with that field. Perhaps Mercury is evidence that that theory is somewhat incorrect? What I find interesting is that after reading the paper on Astro-ph last night, it appears that the Swiss team deliberately manipulated the data to change the interpretation. Their model shows a 4 planet fit, but only after they deleted several points. Vogt and collaborators in the new paper last night uncovered this. Also, the Forveille et al paper from last year has a planetary solution that is completely unstable from a Keplerain standpoint. It looks like Gliese 581g is real. This planet, if it exists, is tidally locked. With a combined year/day of 37 Earth-days, it is rotating far faster than Mercury and very well could sport a magnetic dynamo. Even if it doesn't, it wouldn't preclude magnetic fields being frozen into the planet's materials. This doesn't make sense... tidal lock means it doesn't rotate with respect to the star... the same side is always facing the star. It's impossible to be tidally locked and "rotate far faster than Mercury"
Anti - "'Habitable' is a very relative term here. There's unlikely to be any planet in the universe (let alone around nearby stars) that is habitable to the point where a human could live on its surface without a suit"
I agree there is isn't likely any suit free planet (or habitable with even future tech) close enough (where the trip wouldn't kill you) for humans to ever colonize but I surely disagree about in the Universe. The potential numbers of Class M planets is staggering. A suit would be good idea for biological reasons however. Moot point however ... reaching any of them would be like walking to the moon. Modern ... Tidally locked is still rotation (1 rev/year) depending on your reference point. Atmospheric pressure will balance uniformly between hot & cold sides around a tide locked planet given enough time, but until it does, expect strong winds. We can find smaller planets, like the ones mentioned here, by transits, where the planet passes in front of it's star... but to find these their orbital plane must line up perfectly with our vantage point, or they would never pass in front of their star from our perspective. That's exactly correct. I would like to add that both Sirius and Alpha C are binary systems. We know for sure that the orbital plane of both of those binary systems is not aligned with us. Since any planets in those systems would likely also be along that orbital plane, they would never transit from our point of view. Funny, I explained exactly the same thing in another thread yesterday. All the volatiles would eventually condense on the dark side, and stay there, until enough builds up and the planet flips around. On Mercury a year is 88 days, so a 37-day year would indicate faster rotation. Would someone please provide a concrete explanation why they think this planet has to be tidally locked and how you know the rotational period? but I surely disagree about in the Universe. The potential numbers of Class M planets is staggering. Just a few percent more CO2 or a smidgeon less O2 (or more) and we're in deep trouble without a suit. Not to mention all the other gases that would snuff us that must NOT be present. If you add it all up then even with the huge number of planets probably present in the universe you quickly enter the "not bloody likely" region. It will be "Common Gliese" instead of "Rare Earth" now! The system have 2 habitables out of 5-6 planets vs 2 habitables out of 8. And on average they are as Earth like, ESI (0.92 0.72)/2 = 0.82 vs (1 0.66)/2 = 0.83. G581g is scarily Earth-like, Torres ESI index is sensitive to temperature and it is 10 K cooler than us. If G581g exists, it will have huge implications for habitables and Earth similars alike. The new paper estimates at least ~ 20% stars will have at least one habitable! "It's tidally locked. Therefore it has no magnetic field." We don't know for sure if it is locked. Even small planets can have fields as they rotate when they orbit under lock (see resonantly locked Mercury). SuperEarths have more convective mantles, and modern models predicts they can all have a large magnetic field even without rotation; this is a SuperEarth. Finally, a magnetic field is not necessary to retain an atmosphere, see Venus. Especially for SuperEarths that have more mass and could have started out with a denser atmosphere to boot. "It's atmosphere is probably frozen out on the dark side of the planet." "The star is metal poor." I think you have retained an old hypothesis on stars, but it turns out low metallicity only gives slightly less gas giants (likely because the disk disperses faster), terrestrials are everywhere. Also, M stars have more terrestrials than larger stars. I should add on magnetic fields that they, arguably, protect against water loss by protecting hydrogen after photolysis. Venus seems to kick out its hydrogen by ionization & electrostatic processes. But an M star has a spectra with less UV so relatively less photolysis for the same irradiation heating (habitability). Also, in most cases the dominant water "loss" is to minerals, even if they produce them in the first place. Updated disk models seems to imply terrestrials get their small amount of hydrogen from water at accretion. Much more, and we would have had no continents. In short, too many unknowns to predict water content reliably. A large amount of water can protect against hydrogen loss processes. We need to look at exoplanet atmospheres! This is the first I've heard that a magnetic field is dependent on planetary rotation. Isn't the field generated by an active core? A planet could be tidally locked, or even not rotating, and as long as its core is active, it could still have a field. Right? It looks like the planets are no more than twice the size and if we take the average mass estimate it looks like a person will be carrying an extra 100Kg of weight. I'd also like to point out that it took a lot of luck and a couple of billion years of life on earth to produce an oxygen atmosphere. Truly habitable planets within travelling distance of Earth are a fantasy. A better fantasy would be to be able to manage human's destructive tendencies here on the home planet first. the rotation serves to shape the currents in an active core into constructive electromagnetic fields, if an active core doesn't rotate, you still have convention plumes, but many small north and south poles that cancel out, at least do not combine to make a big protecting umbrella, i would suspect that mercury, due to its high metal content, combined with a bit of rotation and possibly due to its proximity to the strong magnetic fieldlines of the sun, derives its magnetic field, for the same reasons i suspect that gliese G, with over twice the rotation and many times the core size could have one, its not only size of the core, but also if the rotational period creates favourable resonance with the convection plumes, for instance it could well be that if venus was slightly smaller or bigger that its rotation could sync/produce constructive resonance with the period of its convection plumes. Iys a bit like this modulator buttons on synthesizers where you can dial waveshapes. "This is the first I've heard that a magnetic field is dependent on planetary rotation. Isn't the field generated by an active core?" That is a large subject, and it is fraught with difficulties to model planet interiors and especially field generation. For these reasons, and since it is as I noted not too constraining for habitability but often mistakenly thought so due to observer bias, I haven't dug into the subject. "Low-mass Super Earths (M <= 2 MEarth) develop intense surface magnetic fields but their lifetimes will be limited to 2-4 Gyrs for rotational periods larger than 1-4 days. On the other hand and also in the case of slowly rotating planets, more massive Super Earths (M >= 2 MEarth) have weak magnetic fields but their dipoles will last longer. "SEs might produce significant magnetic fields by dynamos in oxides alone, as does Fe in Earth and metallic fluid H in Jupiter." On the other hand, there are all these uncertainties about superEarths core (solid by pressure/not solid?) and lids (stagnant lid and stagnant mantle/vigorous convection?) that means the extent of convection seems unclear and will remain so for the foreseeable future. - Weight scales with both the planet mass and the surface radius. A 2 Earth-radius planet at the same density will give r^3/r^2 = r = 2 times as much weight, so 50-80 kg for most persons. That is not much, even humans can adapt to that (children will grow more massive bones and muscles). - The oxygen atmosphere arose because a) hydrogen could escape, converting an initially reducing atmosphere to a neutral one, b) photolysis liberates oxygen in the atmosphere and on ices of global glaciations, and c) oxygenating photosynthesis evolved. b) and c) had to happen to overcome the oxidation potential of plentiful iron, who gets redox reworked in the mantle during plate tectonics. All these mechanisms are believed to be likely on other habitable terrestrials. - I don't understand the insistence on arguing for colonization and the fallacy of false choice on science blogs. What is important here is the science inherent in answering some age old astrobiology questions, are we alone respectively how does life arise, which observations of habitables and their properties will help constrain. Funny, I explained exactly the same thing in another thread yesterday. Most tidally locked potentially habitable worlds are in close orbits, around cool stars, with periods in days or weeks, so rotate considerably faster than Mercury. Thus, assuming they have molten cores, they should also have magnetic fields. Again, if it is tidally locked it doesn't rotate, period. A planet with a rotational period of infinity doesn't rotate faster than anything, because it doesn't rotate. I believe the word you and others are looking for is "revolve", as in revolve around it's star... revolution is different than rotation. Rotation is movement about the planets own axis, while revolution is movement about some external or distant axis. A tidally locked planet rotates once per orbit. It keeps the same hemisphere facing the star it is orbiting, so has no day/night cycle, but it has a rotating reference frame that would demostrate a coriolis effect. A true non-rotating planet would have a day/night cycle equal to one orbit around its star. Rotation is movement about the planets own axis with respect to the parent star, it creates day/night cycles. A tidally locked planet has no day/night cycle, so it has no rotation. Tie a string around your finger and a ball at the other end, swing the ball around your finger... your finger is the star, the ball is the planet, the same side of the ball always faces your finger. Now imagine the ball is hollow with water in the center... what will the water do? The answer is obvious. Now consider the same scenario except this time the ball is ROTATING about it's own axis so that the surface facing your finger is constantly changing, now what will the water in the hollow center do? So its 117,569,996,000,000.0 Miles away? Or it would take us at Shuttle speeds 765,260 years to get there. Who cares? What a waste of time and resources, not to mention Internet bandwidth. It's sensible to figure out where you are going before you set off - and not leave that off until you have the drive technology. A planets rotation is a non-inertial reference frame, so its rotation isn't relative to the star in the same way that its linear inertia is. I understand what you are trying to say but your definition of rotation is wrong. A tidally locked body is in a state of synchronous rotation, which is not the same as non-rotation. The water has its own inertia and low friction so the outer ball will rotate independently of it, so from the perspective of something floating in the water there will be a day/night cycle - until friction with the inner walls of the ball accelerate them to the same rotational rate. This is how our inner ear works and why we get dizzy when we rotate for too long. If there was no rotation, we would not get dizzy on a merry-go-round, for example. I'm unconvinced. Rotation or revolution, these are both forms of movement. For something to be said to move it must be compared to something else, it must be referenced to something else. If you reference the movement of the planet to its star than a tidally locked planet does not rotate, it only revolves. If you want to claim that it rotates then you must reference that movement to something else, so what frame of reference are you using? What does it rotate in relation to? So again, a tidally locked planet does not rotate with respect to it's parent star, so what are you claiming it rotates with respect to? Rotation is a non-inertial reference frame, it can be measured by centrifugal forces and the coriolis effect. It is independent of the inertial frames of other bodies. If there were no other bodies in the universe, an accelerative effect could still be measured at the equator. In effect rotation is relative to a body at infinite distance. I realise this might seem counterintuitive but it is standard physics. In terms of the interior of a planet, and coreolis effects acting to generate interior flow, a tidally locked planet with a 24 hour orbit around its star would experience the same effect as we do from our daily rotation. A Foucault pendulum would appear to change the alignment of its swing, just it does here, rotating the axis of swing by 360 degrees every 24 hours (in an imaginary friction-free world). @DC- If you sat in a ship at a stationary point in space 200KM outside the orbit of a tidally locked planet, and watched it revolve around it's sun, you would also watch it rotate as you wouldn't be looking at the same side of the planet again until it returned to the first position in it's orbit that you began viewing it in....that's the best I've got. But it IS rotating around its own axis, as well as revolving around the star. The period for both is the same. If it were not rotating, it would not keep the same hemisphere facing the star. If the star were magically removed, the planet would stop orbiting, but would continue to revolve at the same rate as it has its own rotational inertia. The planets rotation has been synchronised to its orbital period by tidal forces, but it is still rotating. If it were not rotating, it couldn't be said to be tidally locked. Even if you consider the planet-star pair a fixed system, the axis of a gyroscope on the planet will appear to rotate 360 degrees every orbit. If the planet were not rotating, the gyroscope would stay level. not necessarily the entire atmosphere, but critically CO2. If there is a permanent dark side, then CO2 would freeze out of the atmosphere and virtually never re-vaporize. Therefore the likelihood of anything even remotely resembling earth-like life, or for that matter Earth-like chemistry, would be very slim on a tidally locked planet. These factors combine to make Gliese 581g the most Earth-like planet known with an Earth Similarity Index, a measure of Earth-likeness from zero to one, of 0.92 and higher than the previously top candidate Gliese 667Cc, discovered last year. 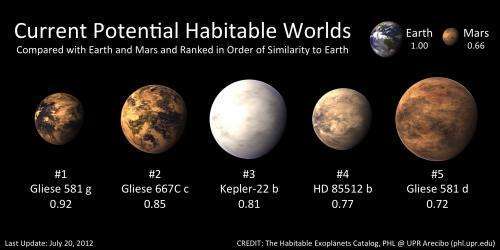 Do you people realize how hard it is to find a human habitable planet? It's not even safe for most people to climb Mount Everest without an oxygen mask, because the air is too thin to support human life, but that's on the surface of our own planet. Just because there's liquid water wouldn't mean we could live on it, not even necessarily with suits. If the wet bulb temperature was like 150f we'd be cooked, and you'd probably literally be better off in a suit on the surface of the Moon than in a suit on the surface of a planet with a 150f wet bulb temperature, because the suit is going to conduct the heat and cook you anyway. In space, or on a moon with no atmosphere, your suit is vacuum insulated, and only gains or loses heat through radiation over a long time. In an wet atmosphere heat transfer by conduction would screw you over, no matter how well insulated the suit is. "Average temperature" says little about the heat index or the maximum or minimum temperature for day or night per location. Landing on the night side of a planet would be a suicide mission since you couldn't see what's down there anyway: lake, river, mountain, desert (all of the above if you're on a glacier). Landing on the day time side, except possibly near the terminator, for a tidally locked planet would be a suicide mission as well. You may as well be landing in a pressure cooker or a solar oven. The average temperature on that planet was in the high 70's in f, I think. The average temperature on Earth is about 57f or so. But the atmosphere might be 50% water vapor for all we know, or it could be zero or nearly anything between.